I asked you all last week what you'd like me to blog more about in 2012 and many of you suggested DIY projects. Thank you so much for your input and thoughtful comments! 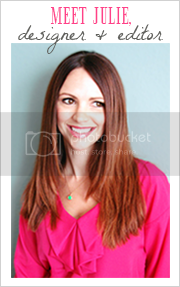 (If you haven't put in your two cents yet, please do by clicking here, you'll automatically be eligible to win a $50 gift certificate to Modern Chic Home!). Today I've rounded up several DIY furniture projects to inspire you. If you're feeling creative and crafty this weekend, maybe you'll want to take a stab at one! Just click on the name of each project to view the instructions. 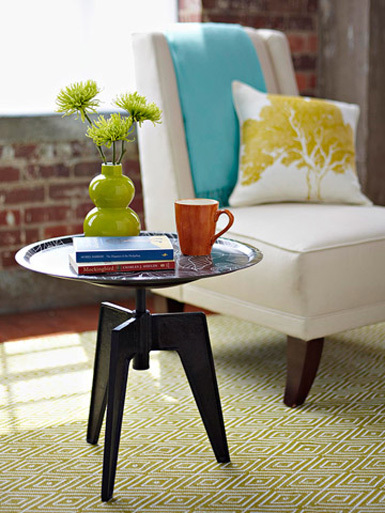 Couple an adjustable-height stool with an oversize tray to create a chic side table (via BHG). 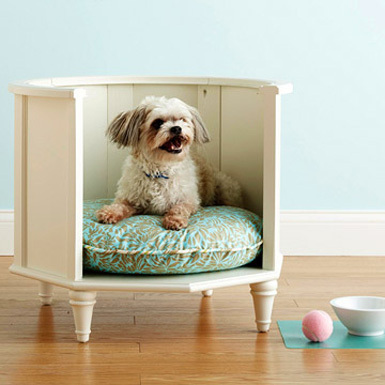 Create a stylish place for your dog (or cat!) 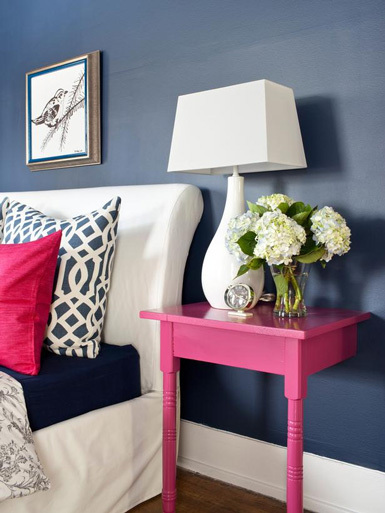 to relax by building a bed made from an unused side table (via BHG). A fantastic idea, especially for those who are tight on space. 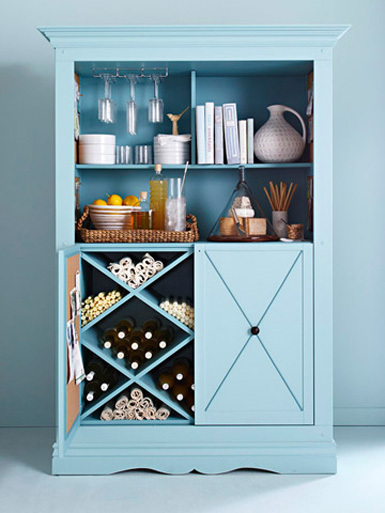 Transform an armorie into an open bar cabinet, equipped with everything you need to serve and store liquor and wine (via BHG). I'd add a patterned wallpaper or mirrored panels to the back of the cabinet for a special touch! 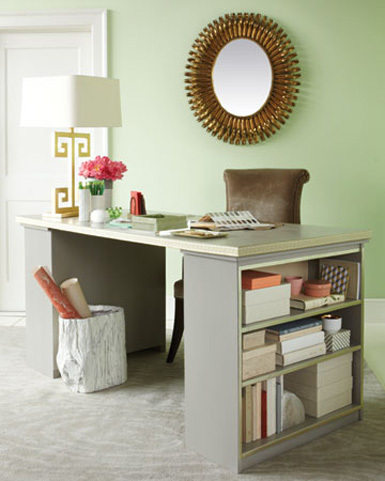 Create your dream desk by attaching a door for the desk top to open bookcases for the legs! 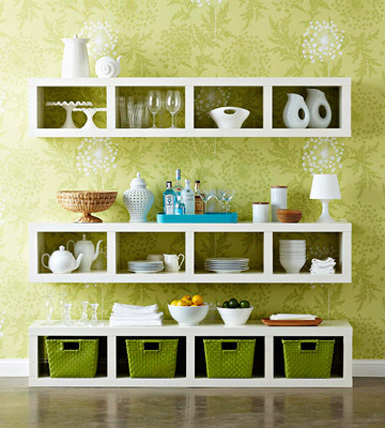 Paint it the color(s) of your choice and display books, baskets and accessories on the open shelving (via Martha Stewart). I love all these image- especially the DIY bookcase and door desk- too cool! Great post! Useful posts! I'm pinning some of them! And the dog bed... so cute! I LOVE THE PINK TABLES!!!! If I make the dog bed do I get that cute little fella too? Love him! oh, my gosh. that dog bed is brilliant! all good ideas here. just might have to use that bookshelves/door desk idea some time. This is fantastic! 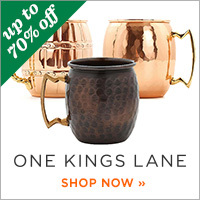 I especially love the side tables & the armorie! Love love the bookcase door table! It's genius!! The bookcase buffet is pretty fabulous!! I like the bar cabinet!